Civil Engineering Department organised five days Faculty Development Program on “GIS Mapping for Smart Development” during 13 – 17 Feb, 2019 in association with RGPV, Bhopal under TEQIP III. 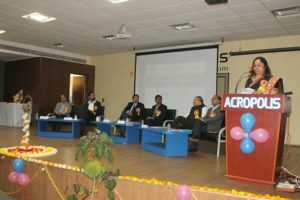 The Civil Engineering Department of Acropolis Institute of Technology and Research, Indore organized a one week workshop on GIS Mapping for Smart Development under the aegis of TEQIP-III, Ministry of Human Resource Development (MHRD,Govt.of India) in Acropolis North Campus from 13th Feb to 17th Feb 2019.This program aims to create awareness about the applications of GIS in civil engineering and update the delegates about allied mapping methods and tools among the engineers, faculty members, students and technocrats . 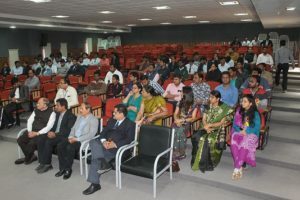 The resource persons of this program included eminent personalities of IITs and IIITs.The program in inaugural was graced by the auspicious presence of Shri. Ashok Sojatia (Chairman,BOG), Dr.S.C.Sharma (Director,AITR),Dr.Jayantilal Bhandari(Group Director,AITR),Dr.Vijay Rode(SGSITS) and organizing Chairman Dr.S.K.Sohani . → National Seminar on “Green Building Recognition Systems: IGBC and GRIHA” under the ageis of Institution of Engineers (IEI), Indore Local Center.